Michen Dewey | The PHOENIX Loyola fans join together in the student section chanting "LUC" after the men's basketball team lost to the University of Michigan. Disheartened Loyola fans filed out of the stands at the Alamodome in San Antonio after the Loyola men’s basketball team fell short against the University of Michigan 57-69 in the NCAA Tournament Final Four March 31. 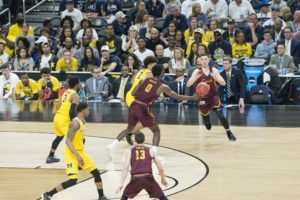 The Wolverines were favored to win prior to the game, but Rambler fans held onto the Cinderella story and traveled far and wide to see the team play. Despite the loss, Rambler fans were still loud and proud of the team as the game ended. With a student section filled with hundreds of Loyola students chanting “LUC,” the Ramblers seem to remain a fan favorite. Some of those proud fans traveled from Chicago by car due to the hefty costs of airfare and travel packages offered by Loyola. Tyler Vonder Heide, a Loyola junior, drove from Chicago after deciding the almost $400 he would spend on the trip was a better option than the more expensive ones. “All in all it was worth every penny. When is your team ever going to make the Final Four and when are you ever going to sit in the student section of a Final Four game again?” the 21-year-old communication studies major said. Vonder Heide, an Illinois native, said he’d never been to Texas so the trip gave him an experience to see the city of San Antonio. The trip wasn’t made in one day, Vonder Heide said, since he was traveling with a friend, Lily Shallow, a junior Loyola student from Memphis. They stopped overnight with Shallow’s family before heading to San Antonio. 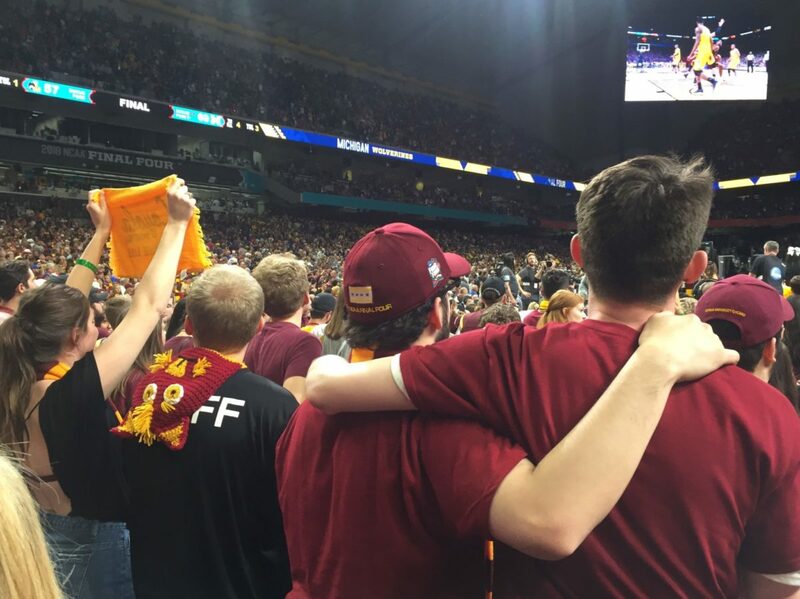 Shallow, 21, echoed Vonder Heide’s pride in the Ramblers, saying it was the perfect opportunity for a trip considering the long Easter weekend, and it could be another 55 years before Loyola makes it to the Final Four again. “[The loss] is sad, but at the same time I’m not disappointed in the Ramblers at all, it was such an incredible ride,” Shallow said. Shallow said she thinks the team can keep the momentum of this season going well into the next with the help of all the fans the Ramblers have accumulated this season. Michen Dewey will be graduating from Loyola in the spring of 2018 with a bachelor’s in journalism and a bachelor’s in photography. She plans on using her passion for helping people and informing the public to begin a career in photojournalism.